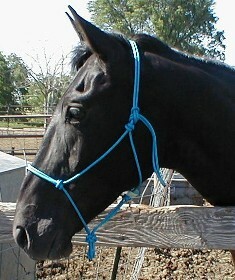 Note: See Halters with Extra Nose & Poll Knots and Extra Nose Knot Halters pages for those style Halters. These are Hand Tied Rope Halters. 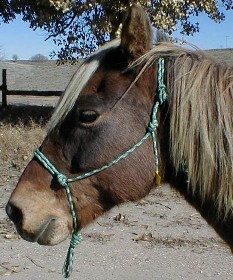 The reason these rope halters work so well, is because they work off of pressure points on the horses head. Have you ever heard LESS is More? Well when it comes to halters that would be the case as well. Do a simple test. Poke yourself with one finger and then with your fist, which applies more pressure? Your finger of course. 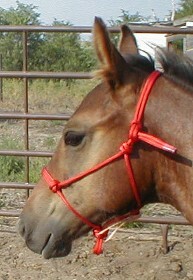 These halters work on that same principle, it is not very comfortable for them to lean or pull on a halter made from a smaller diameter material. These halters will not break if your horse should get it caught on something, so please don't leave on your horses when unattended. 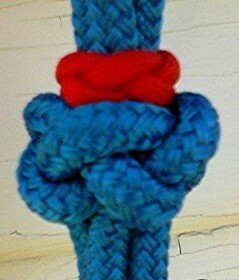 All halters now feature a Knot Keeper above the fiador knot to keep that pesky knot the way it was made. The fiador knot can still be adjusted, simply slide the keeper up and make your adjustments and then side it back down on top of the Fiador. Please read carefully before you order!!!!!! Due to a large number of returns on Mini and Draft Halters I no longer accept returns on them, take measurements!!!! If you have questions please email me other wise add your measurements in the note area at checkout. It saves all of us a lot of time and money. 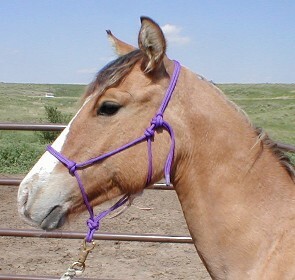 PLEASE ONLY ORDER A DRAFT HALTER IF YOUR HORSE TRULY IS A DRAFT HORSE, OTHER WISE ORDER A LARGE ADULT. I get a lot of returns on Draft halters, because they are ordered for Draft Crosses and they are too large for them. 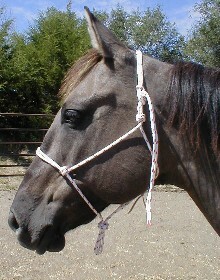 The Large Adult size fits a horse with a pretty large head and will fit most Draft Crosses. The Regular size fits most horses, if your horse has a fine head we would suggest you order our Arab/Yearling size. 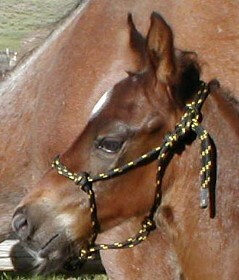 If you have a Yearling that has a smaller type head we suggest you order the Large Weanling size. The above are just guide lines, we always suggest you take measurements to be sure what size your horse will need.